Enjoy Life — till it Overflows! I spent last weekend with some beautiful women. Each one dressed in Jesus Christ from the inside out and doing their best to wear Him well. The conversations shared around tables, over coffee, and in tucked away corners ran the gamut – raucous laughter and poking fun at ourselves to tears shed and hearts laid bare. To me, that’s true beauty, uncontainable radiance in action. Sisters doing life together, bonded by heart and bound by soul to other daughters of the King. Some meeting one another for the first time—not a thing in common but their love for their Jesus. Each one stretching outside of themselves to connect with His people. The blessed sisterhood hand-picked for them by the lover of their souls. “rest of the soul — refreshed heart” living is the mental expression of our spiritual reality. Christ came so that we could have life and have it the full. Not do just a little bit of living, but really go after the thing with all He has created us to be. The Amplified Bible translates John 10:10 in such a way that I can’t keep the smile from creeping across my face and my heart simultaneously . . . The thief comes only in order to steal and kill and destroy. 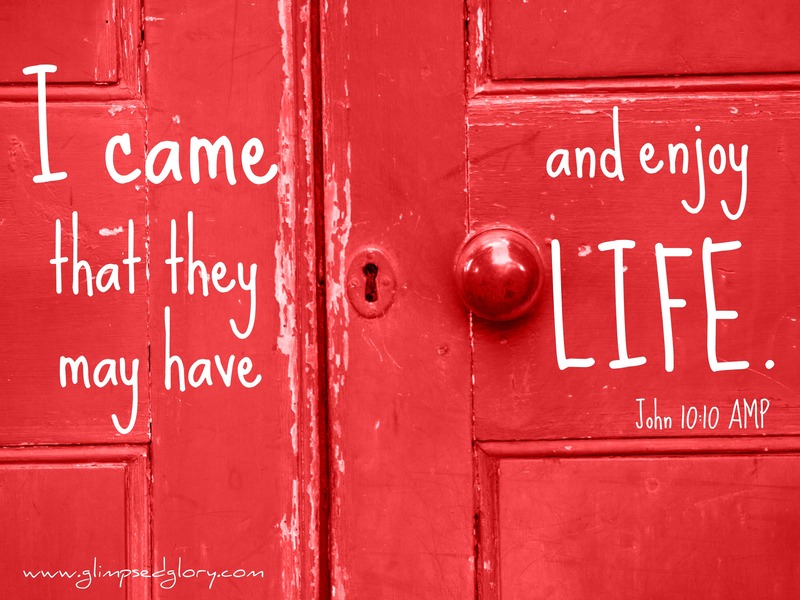 Isn’t that wonderful – enjoyment of life with the Life Giver. Abundance that does not change with the ebb and flow of our circumstances. Life to overflowing that isn’t subject to our limited human vision. we cannot mess it up so badly that God changes His mind about His love for us or about the way He wants to raise us up for Kingdom purposes. The same God who brought you through fire and water – a wall of despair on the right and a wall of destruction on the left – kept your feet from slipping and delivered you to a place of abundance is alive and well within you this very moment. And the Spirit of God has not come so you might simply survive—He has come so that you may thrive. He has crushed the head of your enemy with the heel of Jesus Christ so not one obstacle stands between you and the Father. Jesus Christ has overcome them all so that you and I, those who believe in their hearts and confess with their mouths that Jesus is Lord, can not only approach the throne of grace with confidence – we are welcome to live there! Do we get that? I’m not certain I do. I hope you’re further along in the process than I am because too often I find myself unaware of being in the Presence of God. I too often confine Him to my “quiet time” or to Sunday mornings and leave behind the all-encompassing knowledge that He is always with me. And that’s when it begins – hanging on by my fingernails, gritting my teeth, fretting and stewing about life from one day into the next. I forget God and I remember me and when I’m at the center of me – well, suffice to say nothing goes well. I put my own slant on life and quickly become consumed by myself—beleaguered by insecurity, embittered by rejection, and eaten alive by someone else’s blessings. But even then, God does not change His mind concerning me and the Blood of Jesus still flows for me. Isn’t that something? Standing before Him, in all my “me”, and He doesn’t change His mind. Maybe you have those less-than moments too, when you stand before Him in all that is “you” and He doesn’t change His mind. I want off the merry-go-round that constantly spins me back to the place where I begin and God is forgotten. I want the life my Pastor calls “present-time-Christ-conscious living.” Centered on my God, revolving around my Jesus, and led by the Spirit. Not hit-and-miss, but all day every day—standing so close that the shadow of refreshment falls over me day-by-day, moment-by-moment. Girlfriend, that’s what we were made for, life in His Presence—His overflowing, to the full, abundant Presence. So you leave yourself behind, tuck yourself inside the refuge of His wing and make your home there. Don’t forget where you live for one single moment. The place of heart refreshment, soul renewal, and spirit rest will not be found apart from Him. Move through this life so closely connected to Him that His shadow covers you from head-to-toe and in that shade Sister, I promise, based on the authority of His Word, you will find what your heart is longing for. This post is part of the #mywritingprocess blog tour. I was invited to participate by the most encouraging young woman I have the privilege of doing cyber life with. You can find her, Spirit-filled and heart full of Jesus, at http://igivegodalltheglory.wordpress.com/. I cannot tell you how amazed I am that God has seen fit to take Glimpsed Glory around the world to more than 70 countries at this point. Oh, how I pray it is encouraging every Sister that visits to stand strong in the faith and to live well in His Name. I’d love it if you would join the journey by following the blog and having new post notifications sent straight to your email. You can also find Glimpsed Glory on facebook with daily encouragement and @glimpsedglory at twitter. Thanks for stopping by and thanks to I give God all the Glory for the opportunity – Keep shouting His praise from the mountaintops Miss Jennifer! ← Blessed is She . . . Really? So thankful for you and looking forward to continuing the journey together. Blessings to you Miss Jennifer! Beautiful, inspiring, glorifying. I love this post – and especially love that your overflowing cup is filled with coffee! 🙂 So glad I found you through precious Jennifer. So welcome — Glad you had a moment to read in the busyness that is the Kissling life! Congratulations to you Papa of the Bride!